A 46-year-old man thought he would never see again after a devastating eye disease robbed him of his sight. Yet these amazing pictures show the moment Miikka Terho was able to identify a banana placed before him and spell out his name after he was fitted with a revolutionary microchip. 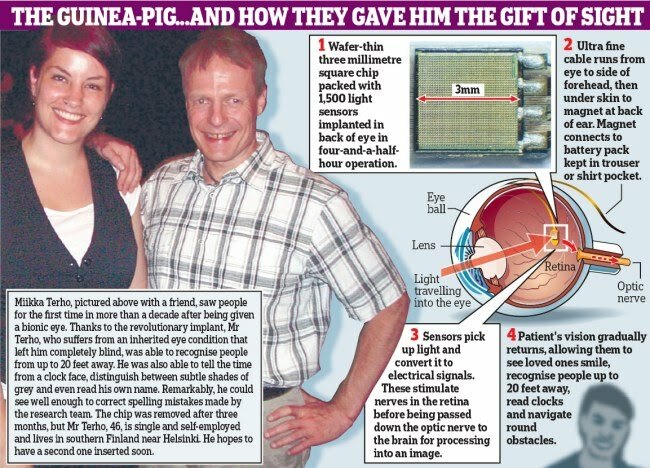 The implant is placed at the back of the eye allowing men and women who thought they would never be able to see again to read the hands of a clock and identify everyday objects. One man saw his girlfriend’s smile for the first time, while another was able to read his own name. It is thought the device could even work in certain cases of blindness from birth. Video footage released by the Royal Society shows patient Mr Terho from Finland studying an apple and a banana. 'This one on the right looks longer and is curving,' he told scientists looking on. 'It could be a banana,' he adds, causing the team to break out in spontaneous applause. The results have been described as ‘quite astonishing’ by eye surgeons and the first Britons could be benefiting within months. Experts say the sub-retinal implant could revolutionise the treatment of blindness in the same way as cochlear implants have transformed the life of the deaf. First to benefit will be people with retinitis pigmentosa, a hereditary disease that gradually destroys the light-sensitive retina at the back of the eye leading to total blindness. But in time, the bionic eye could also be used to treat age-related macular degeneration, the most common cause of blindness in the elderly, which has no cure and affects some 500,000 Britons. The device, the brainchild of German firm Retina Implant AG, consists of a very thin microchip, just 3mm by 3mm in size and packed with 1,500 light sensors designed to replace those in the retina lost to disease. Although bionic eyes have been piloted before, this battery-powered implant is the first not to require cumbersome accessories such as a camera mounted on dark glasses. Today, a prestigious journal, Proceedings of the Royal Society B, describes how the implant allowed two blind men and a woman to see shapes and objects for the first time since losing their sight to retinitis pigmentosa. Within days, all three could ­visually locate objects placed on a table, including a cup and saucer. Several more have been treated since. 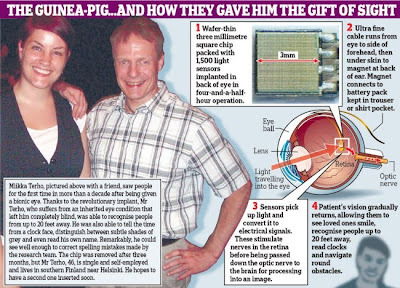 Researcher Dr Eberhart Zrenner, founder of Retina Implants, said: ‘One young patient told me how he looked at his girlfriend and saw her smiling. Another patient was sitting in her garden and suddenly discovered a sunflower outlined against the sky. Professor MacLaren, who plans to start testing the device in Britain early next year, described the results as ‘quite astonishing’. The consultant eye surgeon said: ‘Up until now, this concept would have been considered only in the realms of science fiction. The device is expected to cost £20,000 to £45,000, on a par with training a guide dog. However, it does not work in all cases and much more work is needed before it becomes widely available, perhaps within five years. Professor MacLaren said: ‘There are still many questions, such as how long the chip will last and how it might be improved.